Machaut's extraordinary Messe de Nostre Dame was not only the first complete mass setting in history, but also the first whose composer can be identified, making it emblematic of the Ars Nova style of the 14th century. In this recording, the Orlando Consort performs the mass in parallel with a work by Tarik O'Regan (born in 1978) which was inspired by it. Scattered Rhymes links two texts from the same period as Machaut's mass, one by Petrarch, the other an anonymous English poem. Both of them subtly combine earthly and divine love, while the music blends polyphonic tradition and contemporary inspiration. "Probing the line between very old and very new music, the Orlando Consort's latest CD sometimes makes it difficult to tell which is which. The O'Regan piece -- in which the fourmember Consort sings the Petrarch and the Estonian Chamber Choir, the English poems -- sounds exquisite and delicate. The result is a kaleidoscope of color for the ear that shows the variety and modernity of so-called early music." 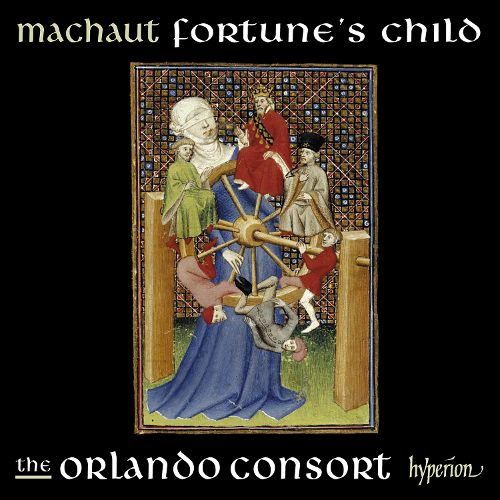 "The rippling vocal invention and vibrant rhythmic pulses of Guillaume de Machaut's thrilling 14th-century Notre Dame Mass radiate across the centuries to Tarik O'Regan's 'Scattered Rhymes' (2006) in this appealing disc devoted to musical and poetic affinities." "I'll end by urging anyone interested in a consistently engaging, musically challenging, and aesthetically rewarding experience to delay no longer: get this disc!" "This is one of the most fascinating CDs of recent times." he Consort's perceptive accounts of Du Fay's Ave Regina celorum and Gavin Bryars's Super flumina complete the picture." "Singing and music are of the highest order. The superb UK-based Orlando Consort (a countertenor, two tenors, and baritone), founded in 1988, is paired with the straight-faced Estonian Philharmonic Chamber Choir... choir members sing with a soaring, innocent resonance that inspires the deepest respect. This disc will likely be in the running for multiple awards later in the year. It's that good."